Accommodation and amenities at La Finca Golf Resort & Spa. 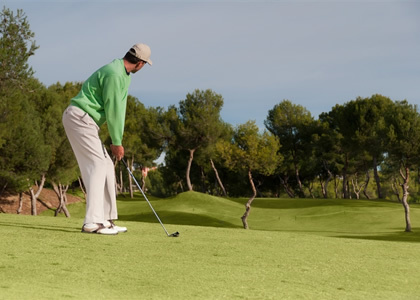 La Finca Golf: A course with wide fairways and generous greens. Spectacular and unique. Not to mention the views presented to the entire district of Vega Baja del Segura River. Enjoy the warm rooms with large terraces and views of the golf course . Fully equipped and with plenty of natural light, spacious bathrooms with rain shower, separate tub, hair dryer, magnifying mirror, bathrobe and slippers. All rooms have double or twin beds. They are perfectly designed to ensure a good rest. The pistachio rooms come with king size or twin beds, Wi Fi, LCD TV and safe. The spacious bathrooms are equipped with a rain shower, separate tub, hairdryer, magnifying mirror, bathrobe and slippers. All rooms overlook the pool and gardens. Ideal to enjoy a pleasant stay. Are you seeking tranquility?This is your room. Fully equipped as the others but with the plus of peace. It includes, a bigger terrace with 2 loungers and a umbrella, a kettle with infusions, one thermal circuit of 90' at La Finca Spa, flowers in the room, incense and late check out until 16h00. Surprise and sweeten your stay at La Finca Resort, with one of the Romance Sweet rooms, taking care of the smallest detail for the perfect getaway. It comes with VIP check-in, sweets and champagne for two, seasonal flowers, candles and incense to acclimate, 1 thermal circuit at Spa La Finca for two and late check out until 16h. Are you looking for a spacious room with a desktop to do business? This is your choice. A full equipped room with a desktop, a Alicante wine bottle with cured ham, newspaper of the day selected by the guest, free Wi-Fi, flowers at the room and late check out until 16h00. 2 Rooms interconnected with an internal door, ideally suited for families with up to 3 children. With fantastic views overlooking the gardens or the stunning La Finca Golf course. The perfect suite to enjoy a unique experience at La Finca Golf & Spa Resort. Decorated with fresh flowers and large terrace overlooking the fabulous Jardines La Finca. Also we include in this room package 15% on all of the Spa Treatments. Disconnect from everyday life and immerse yourself in the peace and tranquility of Spa La Finca with the Relax Pack consisting of 1 aromatic massage and a half hour thermal water circuit 90 minutes for two people. The relaxing power of water will help you tone your body in the heated swimming pools, water cascades and saunas. A magical space where you can enjoy views of the stunning gardens and outdoor pools. Discover the pleasure of submerging yourself in the thermal waters providing the effect of repairing your body and enjoying multiple sensations that will liberate your day to day stress ans achieve a healthy balance between mind and body. With views of the hotels gardens and the golf course, the Jardines La Finca Restaurant is the ideal place to enjoy Spanish cuisine with outstanding views. The cafe-bar is the main meeting point of the Hotel during daylight hours. Its terrace overlooks the hotel gardens, the golf course and pool. The perfect atmosphere for relaxation, which also offers seasonal Mediterranean cuisine and lunch. The buffet restaurant at Hotel La Finca Golf & Spa offers a wide selection of fresh produce and local breakfast buffet. The pool bar is the perfect place to enjoy a cocktail or a refreshing beer while tasting an aperitif beside the outdoor pool. Suite Lounge Club: opening the 15th of March 2014 from 17h. The 3 meeting and banquet rooms accommodating up to 250 guests combine the finest service with 21st century technology. • A Vineyard and wine tasting tour is a great opportunity to taste and learn in depth some of the most important wines of the province of Alicante, you can taste them accompanied by typical local sausages and enlivened by a professional who will be on hand throughout the visit . • Another must see is the oil museum, currently the olive oil is liquid gold in Spain and this visit becomes an experience for all five senses. Located about 40 minutes from the Resort. • Alicante and specifically the area around the resort, the Vega Baja, is famous for its nature and its magical places. The resort is surrounded by natural parks have flora and fauna.• Just 20 minutes from the Resort you will find the Salinas de la Mata and Torrevieja, form a unique place, a swim in its therapeutic waters are highly beneficial for the skin and bones. • The Salinas de Santa Pola is a unique setting in which there are different species of flora and fauna with a wonderful landscape tinged pink by the salt waters. •The sands of San Pedro de Pinatar, are known to offer the largest area of outdoor mud therapy across Europe.